You will get the same from me in 2013! To see the larger picture – left click on it! I was nosing around today and saw this great idea on the blog of @PumpkingPuddy “Adventures of a Suburban Kitty” and *whispers* I stole it, the idea that is! You may or may not be aware but I’m not impressed with huMum taking my picture so I made myself scant … it was dawn and, as you know, that is prime time for catching mice before they return to their nests after a night scavenging in the bins at school football oval behind my home. OK it is time to fess-up … I’ve been overwhelmed with the generosity of my furiends and went on strike! I’m refusing to play with my toys when huMum is awake. Its another matter when she is asleep as, gradually, I’m emptying my toy box and giving each a thorough inspection (and a bite or bunny kick to check quality). The point of this post is to to thank YOU (yes I’m looking at YOU). The kindness and love experienced has made this festive period one that will always bring smiles to our faces and warm feelings in our hearts. A few months ago the gorgeous @clingycat had the bright idea that anipals from Australia and New Zealand (ANZACs) should all participate in Secret Santa. This meant we all went in a draw and we would be Secret Santa for the anipal chosen for us. The two things my huMum is really good at are organising and nagging. 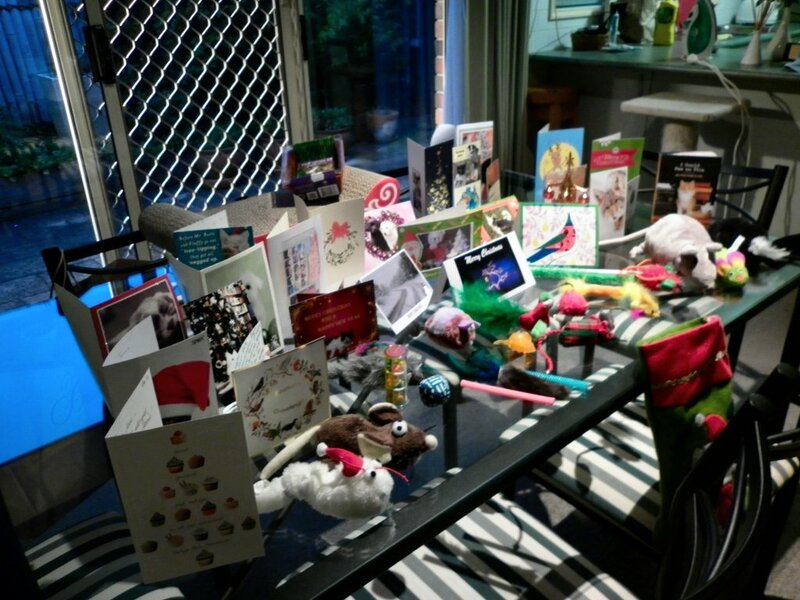 Our pawty, to open the pressies, is going to be held tonight (Sunday, 23 December, 2012) and I’m so very excited! Can’t wait to see what everybody has received. I have *sad ears* though as huMum hid my pressie when it arrived courtesy of Mr. Postie and, she now tells me, she can’t remember where she hid it! To see the larger animated picture – left click on it! In australia, Christmas comes in the middle of a very hot summer. old man kangaroos called the six white boomers. From the evening of Saturday, December 8 through to the evening of Sunday, December 16 I wish all my anipal furiends a trully wonderful Hanukkah! PS If there are any delicious noms left over, there is a hungry panfur in Melbourne ready to assist you. I did, I did! To be honest I didn’t actually kill it but I was indirectly responsible for its temporary death! Think I’ve told you that it is mouse season in Melbourne. Every late Spring, early Summer they seem to appear from nowhere. If you are not aware, then I’m here to tell you, that mice breed like “rabbits”. I think they practice all winter long and when the jacaranda blossom appears so do the baby mice. Being a very noble panfur I let them grow until they are at least 5cm long (not including their tails) before I go on safari. So huMum has been getting a lot of exercise this week as I have produced a mouse a night (except Tuesday). As she is only too familiar with the peculiar miaow I make when my mouth is full, the chase is on before I have a chance to proudly display my catch. To my chagrin I was twice tricked into giving up my live squeaking prey; the third I got bored with and left him in kitchen (see HERE) to be buried by huMum in the green wheelie bin. So what happed to the fourth mouse? I let huMum chase me up and down the hallway, in and out the study, bedroom, bathroom and even in and out of the “little girl’s room” (whatever that means). For goodness sake I wish humans would call a spade a shovel and their litter tray a toilet or if they are Australian a “dunny” or the “boghole”! I digress. Where were we? Ah that’s right in the middle of the chase. After at least 10 hours oops minutes, I made the mistake of ducking out my cat door and huMum shut the door from the laundry to passage and *wail* I couldn’t get back into the house. She turned on the garden lights to watch what I got up to with my “mouthful” of mouse but was distracted by the telephone. The next time she checked I was sitting with *innocent ears* at the patio doors paw pointing at my empty mouth (just like my all-time hero “Simon’s Cat”) and miaowing to be let in. Chuckling to myself here as I know I’m annoying the dickens out of you with all this waffling on and never, seemingly, to get to the point of my story. That is why its called a yarn or is that yawn? The next day Sandy, our delightful cleaning lady, was busily vacuuming and got to the laundry when, from my the top of the garage roof, I heard a huge THWACK and the stereo (on which Pink had been playing) went off as did the vacuum. As Sandy and huMum were muttering a lot I had to come down from my perch to check out what was going on. Yes *paw punches the air* the vacuum was lying in pieces in the middle of the hall and huMum was telling Sandy “something must have blown it up?”. She reappeared about two hours later and I was ever so pleased as it was nearly dinner time. One look at her face told me that I was in deep doo doo yet again and for the life of me I couldn’t figure out why. Worse still the dreaded vacuum was back! There is nothing more dire than huMum in a bad mood so I tried to appease her with much rubbing of her legs, gentle mews and loud purrs but instead of a pat and a scritch I got sent to the naughty chair! Once ensconced she told me that the vacuum repair man charged her $55 to repair the blown fuse and showed her the cause. Yes! You guessed it, my fourth mouse! Unbeknownst to huMum, while she was gossiping on the phone the previous night I’d bought the fourth mouse back through my cat door into the laundry but as the door to the passage was so rudely closed I had dropped him and, being a very smart mouse, he’d had taken up residence under the washing machine. 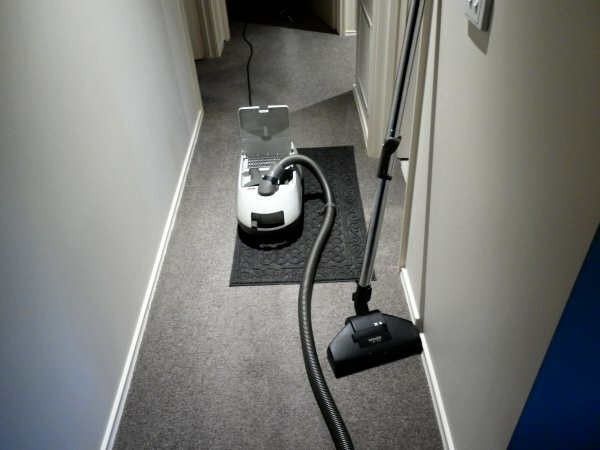 Sandy being a very thorough housekeeper had directed the vacuum right to his new home and swooped him up! TWACK! To all you vacuum fearing cats out there, you now know there is a way to slay them but be prepared for the consequences. HuMum did not get over her sooky mood for at least two hours! Do you remember I wrote about huMum telling me on our first day together that my Uncle would build steps to help me climb our 9 foot fence? It took him ages to get it done as he always had other chores to do for huMum and I had proved to them that I was very capable of scaling the fence without their help. About 10 days after arriving at my forever home, I gave huMum a big heartache when I went out to explore my new neighbourhood. I left at 7:00 am, just after breakfast, and didn’t return until 8:00 pm! Please don’t tell huMum that I have admitted to being just a tad lost. I could hear her calling me but I kept being distracted by all the birds, finding possum nests, watching the kids play Aussie rules football in the park and, best of all, climbing a tree and teasing the dog in a garden about half a kilometre away, plus locating some really great places for cat naps. Eventually, as I was so hungry, I had to go home and, I must admit, it was a great relief to see our roof from my perch in yet another tree. Talk about a fuss when I pushed through my cat-flap and miaowed “I’m home!” HuMum didn’t know whether to cry and cuddle or be stern and lecture. It ended up being a mixture. It also was my first time on the naughty chair, but that is another story. I did learn a big lesson, huMum was happy for me to explore but if I heard her call “Jessie” then I knew it was time to go home. We made a pact that I’d never worry her like that again! I also learned that she was not too impressed with me sitting on the roof of our neighbour’s house and this confused me as she was happy for me to sit on our roof. So what if their roof is double the height of our roof, right? Wrong, I could see huMum looking out the kitchen window, then rushing to the patio doors screaming out my name with her hand over her mouth and terror in her eyes. Oh dear, I was in deep doo doo! It only took me about two minutes to get home but I think I was responsible for her looking so very pale. Another hour on the naughty chair and another lesson learned. I still regularly visit that tall roof but I make sure huMum is safely tucked up, snug as a bug, in bed. In the summer of early 2006, huMum and Uncle disappeared in her car so, as is my practice, I patiently waited at the front window for their return. Finally they got home and there was so much new gear in the hatch for me to investigate. A 2×10 plank of wood, hammer, nails, drill, saw, brackets, tape measure – the garage and courtyard were full of all this mannish equipment! They measured the long plank of pine-smelling wood and, using the saw, cut it into 4 bits. I heard huMum nagging my Uncle, “Make sure they are big enough for her to sit on!” I felt a bit sorry for him because she was getting in his way and he was muttering under his breath. Eventually he told her to go and make them a ‘cuppa’. Now it was my turn to help him so I organised all his zinc nails in a row and then pushed them over to him as they were needed. (Not really, but it does make the story more entertaining.) Truth be told, I spent most of my time up on the roof looking down because the loud hammering and sawing noises were scary. You will have to use your imagination – we have the ugly side of the fence facing our courtyard, i.e. the side with the horizontal beams. Although huMum has made it look beautiful with jasmine, azaleas and camellias, it meant the fence was perfect for the assembly of my stairs as it gave Uncle a place to attach each step. He not only nailed the steps to the horizontal fence beams but, to brace them, he put three brackets under each step so I could land heavily without fear that they would fall off. 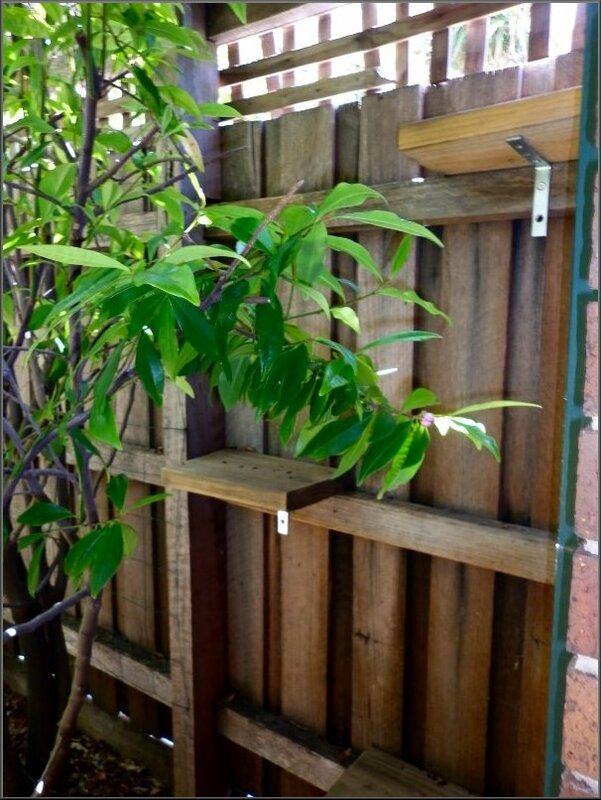 His tour de force was the top step which is bigger than the others and allows me to sun bake and peep through the jasmine covered lattice. It is my favourite outdoor niche as it smells wonderful in summer; I get to spy on the neighbours and hide from huMum all at the same time. “No! Why should I get off the roof onto those steps?” I miaowed when huMum tried to get me to test the stairs. “I’m happy up here, thank you very much. Oh is that cheese I smell.” I try to reach down from the top of the lattice where I’m precariously balancing but huMum has put it just out of my reach so I jump down onto the top step. “Wow this is so very excellent!” They make me go up and down my stairs three times just to prove the steps will carry my weight! How exciting, no more climbing the tall fence. I have the best Uncle and huMum a cat could have, so I gave them lots of nudges and leg rubs to show my gratitude.